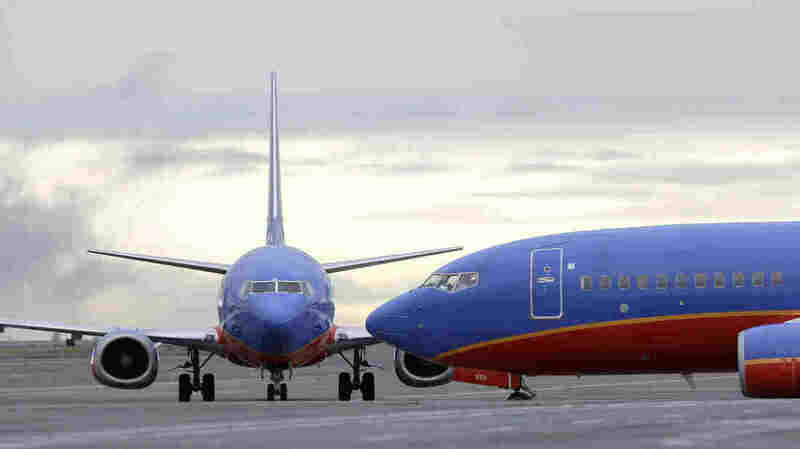 Southwest Jet Loses Some Cabin Pressure During Flight, Lands At Dallas Love Field : The Two-Way Flight 861 was on its way from Denver to Dallas when the crew radioed ahead to ask for help. Four of the 120 passengers said they had ear pain as a result of the cabin issue. Southwest Airlines says that the crew of a Dallas-bound flight "radioed ahead for paramedics to meet the aircraft after a pressurization issue in flight" Here, a Southwest Airlines plane waits to taxi, in a file photo. A Southwest jetliner was hit with a "pressurization issue in flight," the airline says, resulting in oxygen masks dropping and a warning to ground personnel to have paramedics ready when the plane landed at Dallas Love Field on Saturday night. Four of the 120 passengers said they had ear pain as a result. Flight 861 was on its way from Denver to Dallas when the crew radioed ahead to ask for help to be waiting for the Boeing 737. There have been reports that the plane made an emergency landing. Southwest sent NPR a statement saying that the landing was "uneventful," and that everyone aboard was "ending their journey with us in Dallas, as was the aircraft." The plane "underwent a maintenance review," the airline added. Flight 861's standard route is a loop from San Diego to Denver and Dallas each Saturday, according to FlightAware. "I had no idea what was going on or what the outcome was going to be," passenger Glen Eichelberger said. "I reached over and grabbed Josh [fellow passenger Josh Trimberger] by the arm because I didn't know if we were were going to make it or not. There was no communication whatsoever from the flight attendants or from the cockpit as far whether we were in mortal danger." It's the third known case of safety concerns about a Southwest plane to arise in the past month, a stretch that includes a blown engine and broken window that killed a woman on April 17 — the first U.S. airline fatality since 2009. That plane made an emergency landing in Philadelphia, using one engine. Weeks later, another Southwest plane that had been traveling from Chicago to Newark landed in Cleveland, to check out what the airline called "a potential crack to the outer pane of a window."